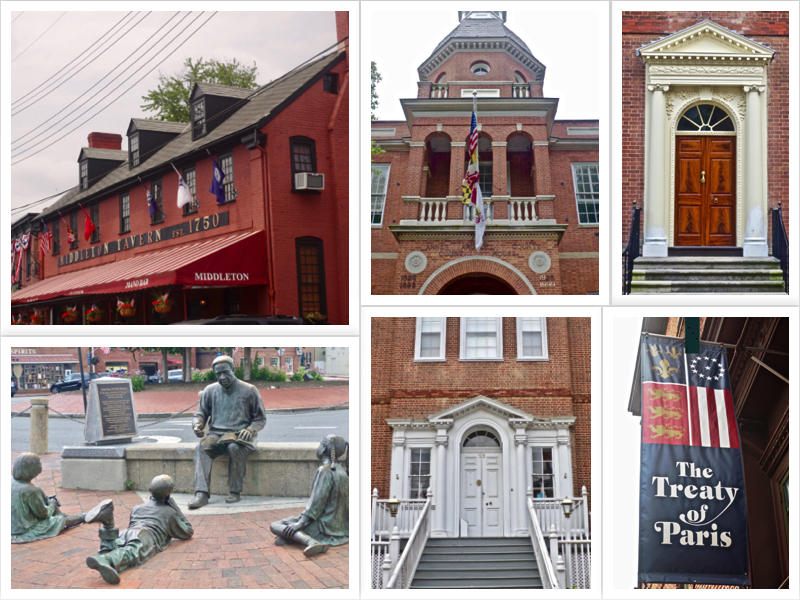 When my sister-in-law asked if we had ever visited Annapolis Maryland, I told her "no, we just never had the chance", she suggested an outing there. I didn't realize it was that close, and jumped at the idea! 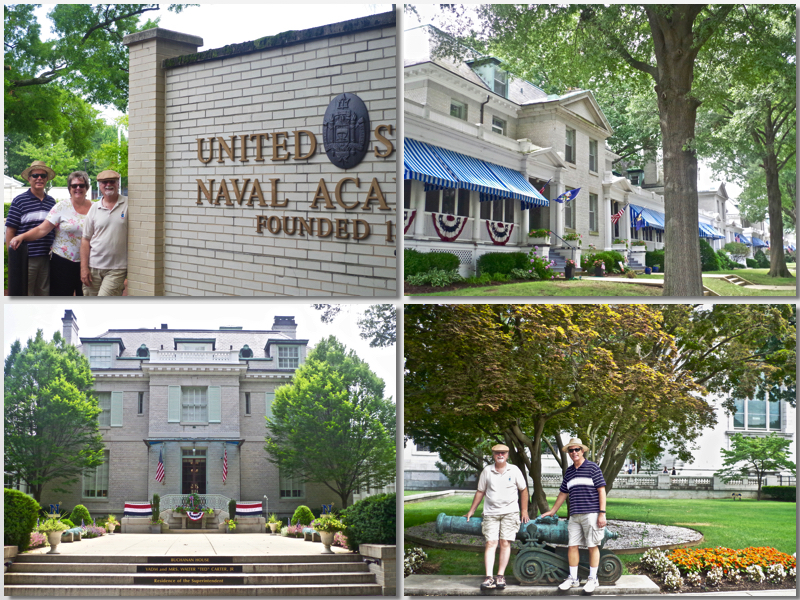 I had always wanted to see the Naval Academy and to be able to do that now was really an unexpected treat. So when we saw a break in the weather, we planned the day. Off we all went, only a little less than two hours away it turned out, and what a cute little town! Kathy had warned me to "wear my walking shoes" and she wasn't kidding! 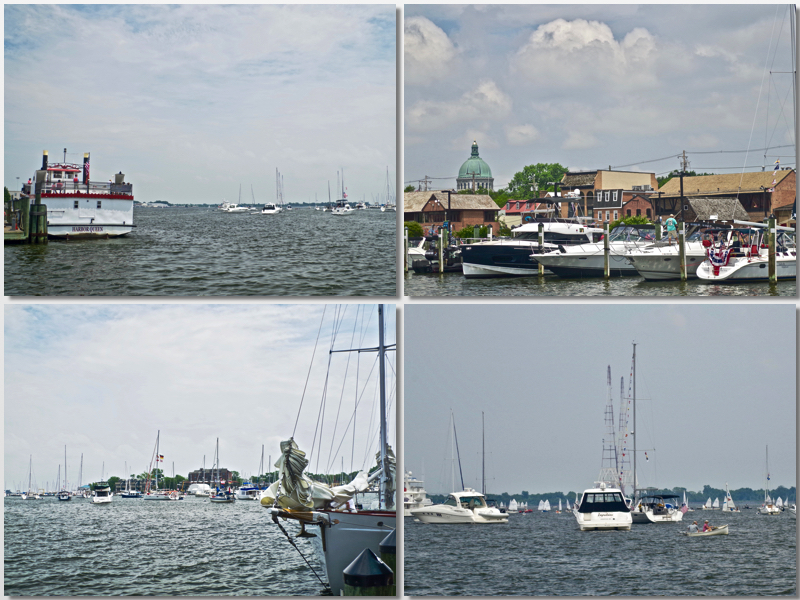 Lots of cute shops, then off to lunch at the Annapolis Harbor. Wonderful spot, right on the water's edge too. It was a hot and humid day, so the breeze was sure welcomed. The best, was the Chapel. Just beautiful. And down below was the remains of John Paul Jones.. in a pretty gaudy crypt actually, but a nice memorial. 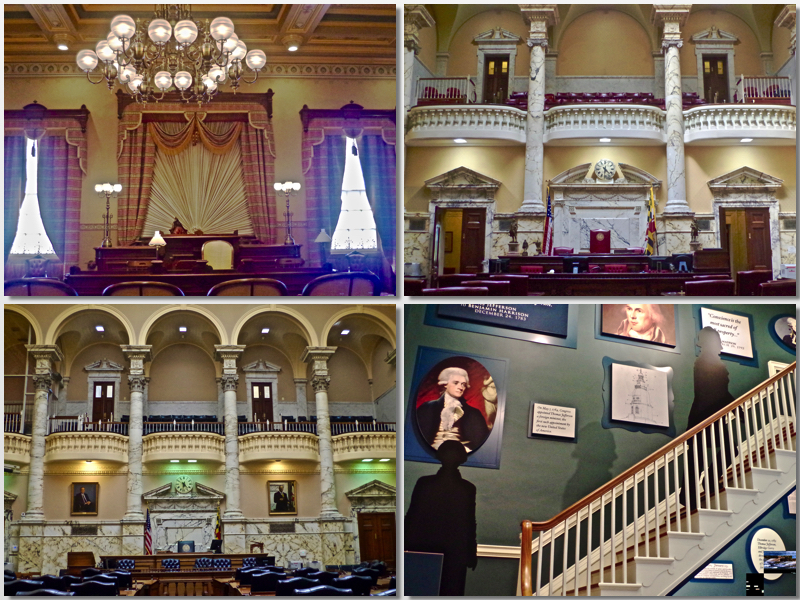 Afterward, while Jack and his sister Kathy rested, Bob and I took off to explore the Maryland State House (Capitol). It is the oldest state capitol in continuous legislative use and the only state capitol ever to serve as a US capitol. 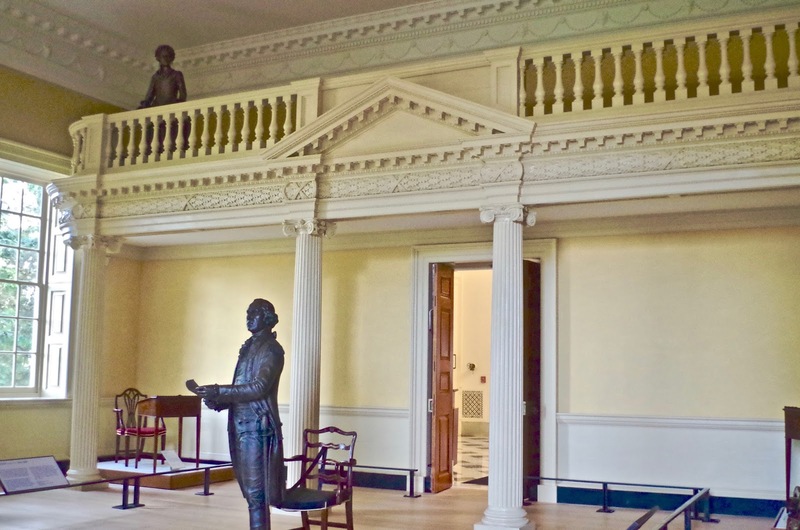 Construction began in 1772. 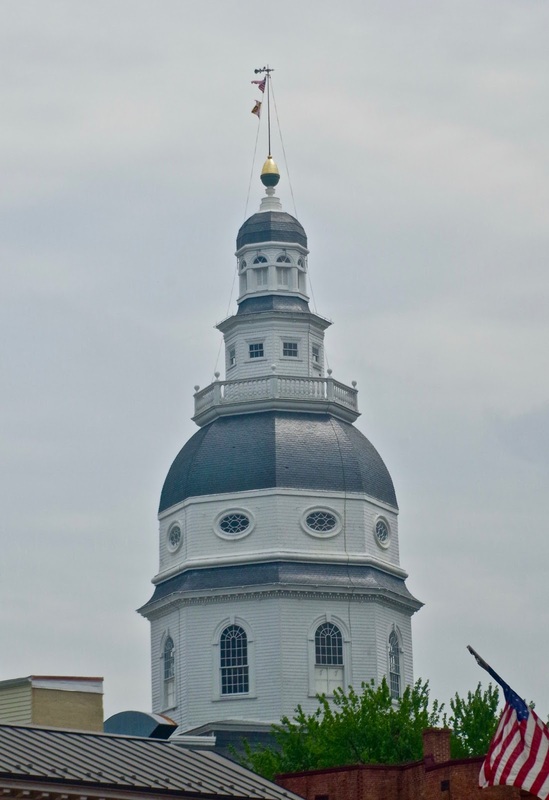 The legislature first met here in 1779. 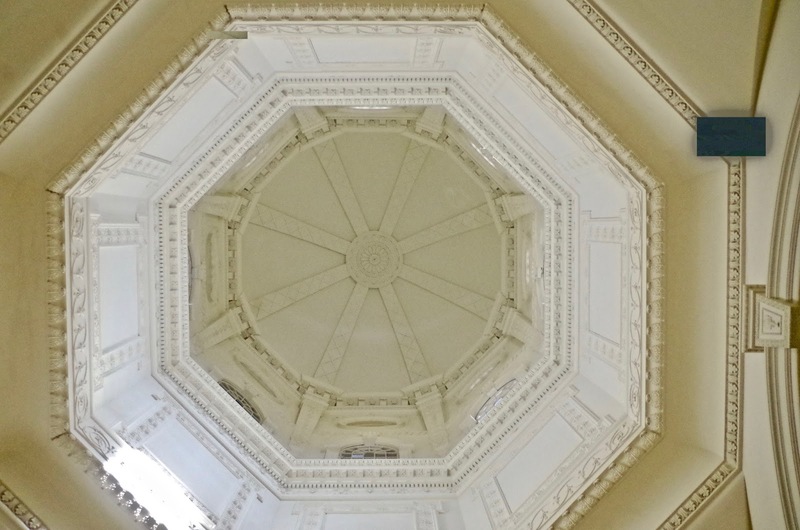 The most dominate feature is the beautiful, and largest wooden dome in the country. 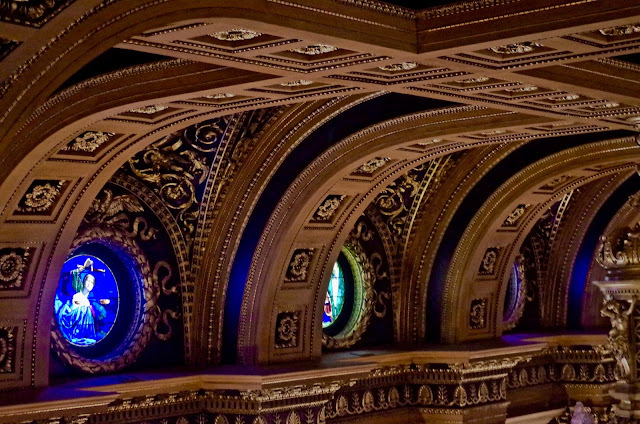 We've seen so many majestic stained glass domes, but to see an all wooden dome, was really cool! 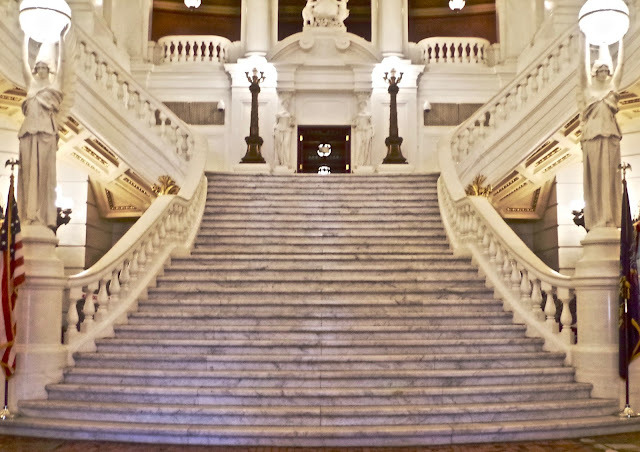 After seeing Pennsylvania's elaborate capitol, and so many other's, I really enjoyed the simplicity of this one. 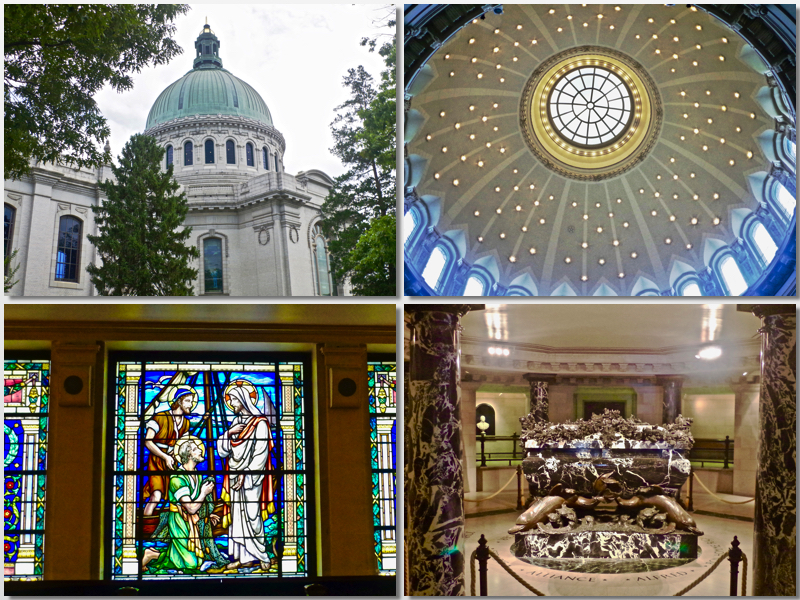 It was still quite beautiful, but clean, not "over the top" fancy. 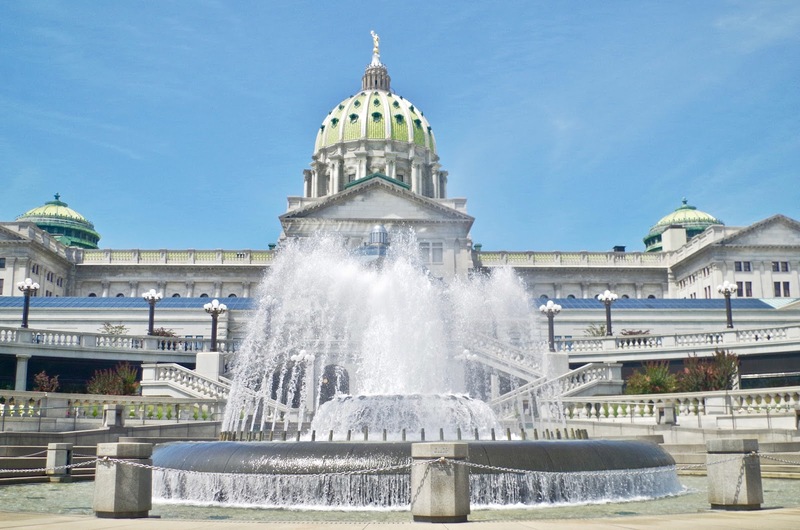 Because of it's day, it did have one thing that no other capitol has had (at least so far that we've seen), and that is a President's Niche & Dais! They also had a nice replication of President George Washington resigning on Dec 23, 1783, with Mary Ridout watching in the gallery in the Old Senate House. 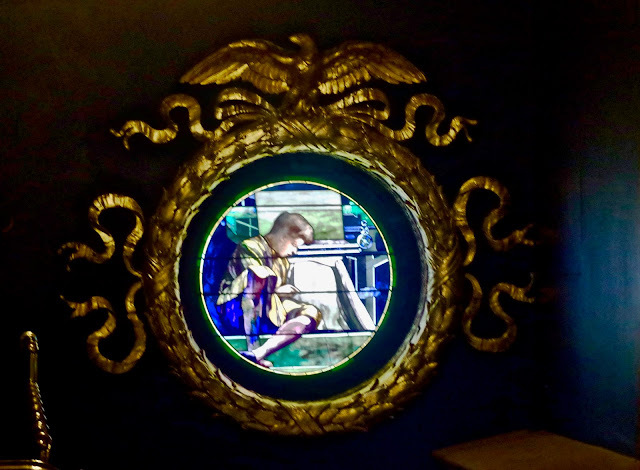 We didn't spend to much time there, quick in & out, since our spouses were patiently waiting for us, but I was so glad we went inside, what a thrill! ...and our visit was over. 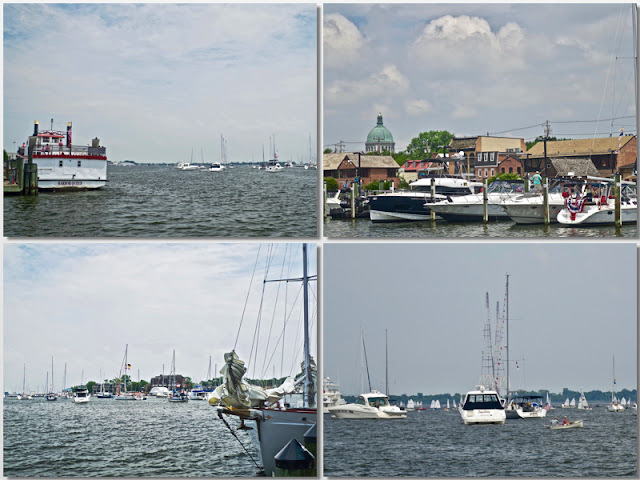 It was time to leave Annapolis and then time to leave our family here as well. A quick trip north to New York state to visit my son and grandchildren, then turn around and head west for a wedding of some dear friends! Ah, the life of nomads! Our trips to Pennsylvania has mostly been about visiting family, and this time was no exception. Jack's sister and husband had recently moved into a new home and we were excited to see it. 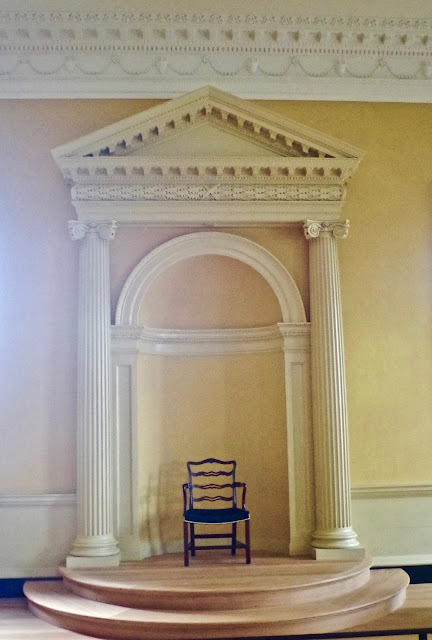 They said they were "downsizing", but when we actually got to see it...not by much! A lovely brand new home in a 55+ community, still building homes all around them. 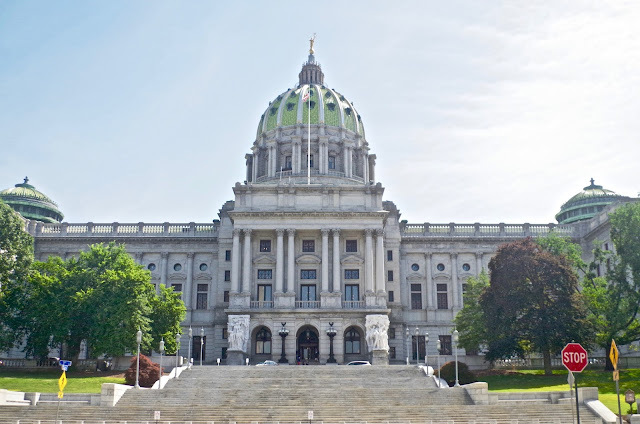 In all the times we've visited Harrisburg, we had never visited the Capitol! So, off we went one afternoon to check it out. Reading up on it, we discovered that when President Theodore Roosevelt attended the dedication of the building on October 4, 1906, he said, "This is the handsomest building I ever saw". The Capitol was designed in the American Renaissance style, and was envisioned as a "Palace of Art". Built and furnished at a cost of $13 million, the Capitol features paintings, stained glass and furnishing by some of the best artisans of the day. The Capitol's centerpiece is a spectacular 272 foot, 52 million pound dome inspired by Michelangelo's design for St. Peter's Basilica in Rome. At it's completion, the building was the tallest structure between Philadelphia and Pittsburgh for 80 years. 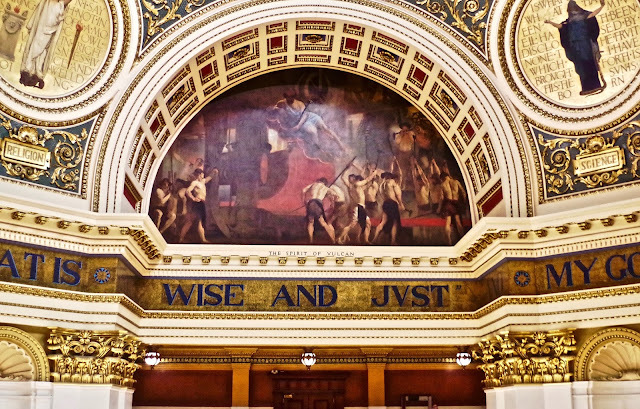 One of the Capitol's most noteworthy features is the colorful Moravian tiles that cover the first floor of the Rotunda and its adjacent corridors. 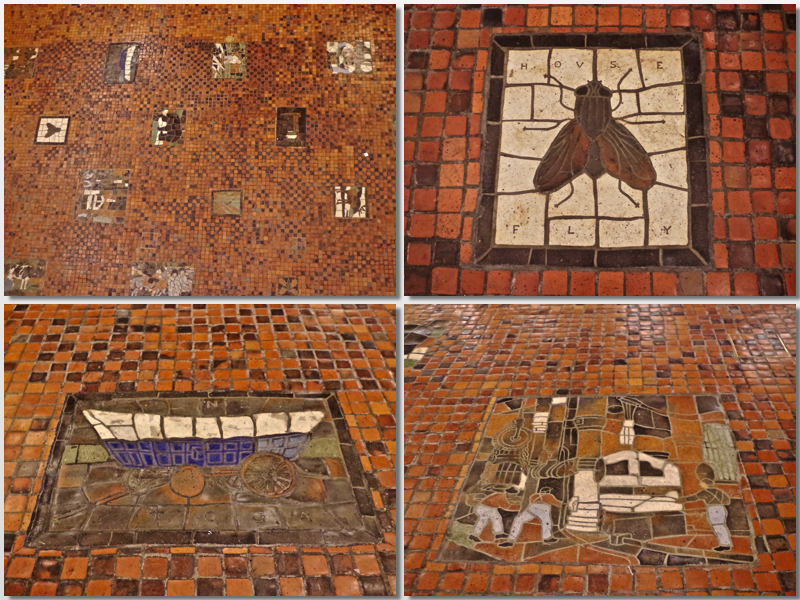 Designed and manufactured by Henry Chapman Mercer of Doylestown, the floor is interspersed with close to 400 tile mosaics illustrating the state's history, animals, industries, occupations and modes of transportation. The tiles are thought to be some of the finest examples of Pennsylvania folk art. As you enter, you don't know whether to look up or down! 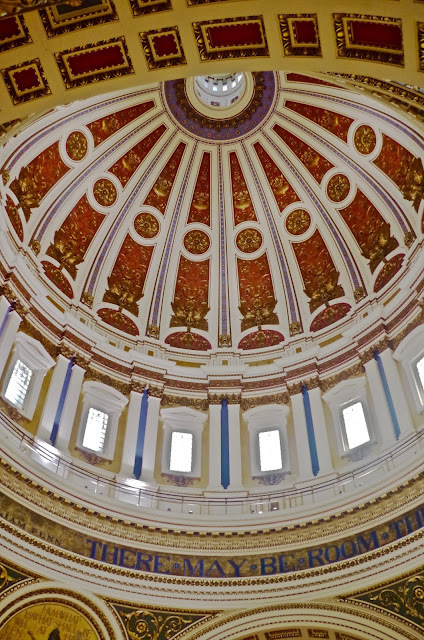 The Capitol Rotunda is beautiful! Many of the Rotunda's design features were borrowed from the Paris Opera House, including the Grand Staircase and three-tiered gallery. Eight large murals by Philadelphia artist Edwin Austin Abbey highlight the Rotunda as a tribute to Pennsylvania and its history. And this was behind the Capitol...Pennsylvania War Veterans' Memorial Fountain dominating the approach to the East Wing of the Capitol. All in all, a lovely building and grounds. On a "lighter" note, they, like many cities, decorate an "animal" each year. Last summer it was a dinosaur ("Dino-Mite Summer"). 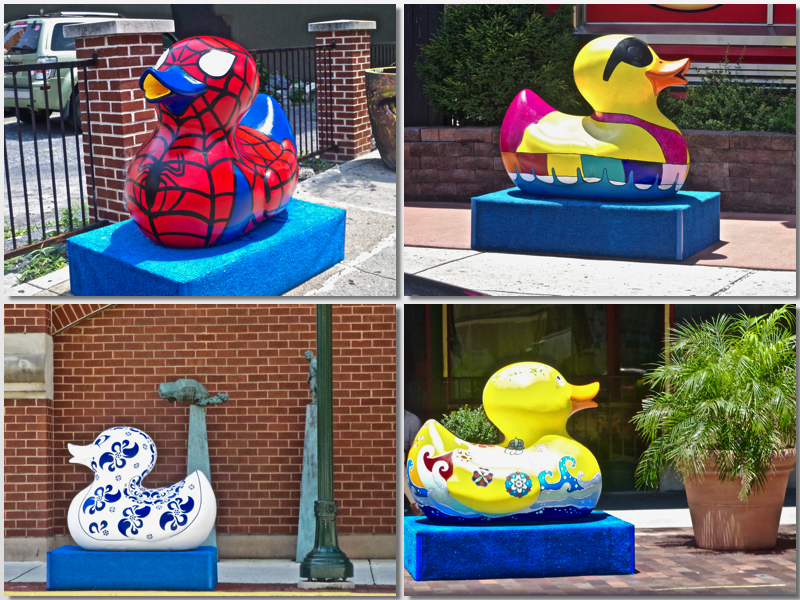 This year it is ducks...so cute, I couldn't resist taking a couple of pictures! 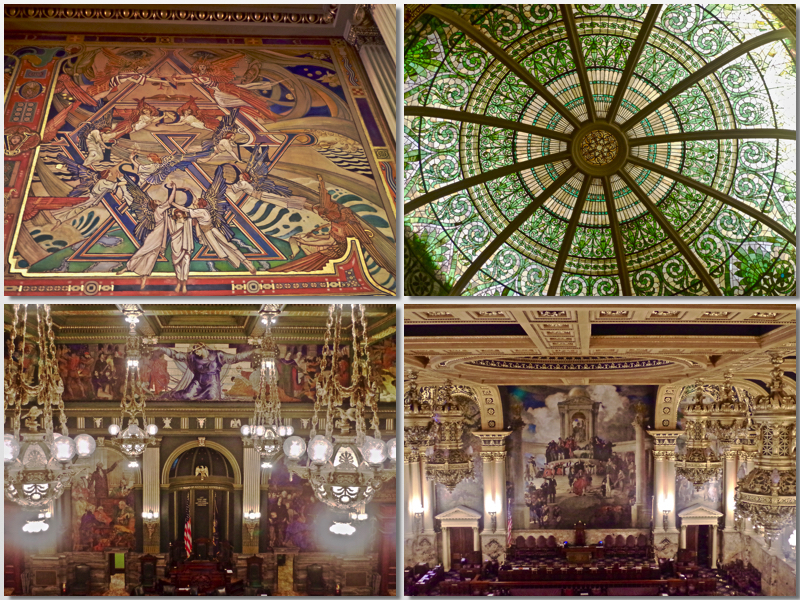 It was a great day and we were able to add one more Capitol to our list!